The question of who should buy the engagement ring is a difficult one. While it’s usual for the groom to actually pay for it, many brides want the option of choosing it. On the other hand being presented with a sparkling diamond when you get engaged is very romantic. Here are some of the pros and cons of the man buying the engagement ring. There are a couple of reasons why a man shouldn’t propose with a ring, the first being that it adds a lot of pressure on his partner. Men spend months if not years working towards a proposal; it’s not fair to expect a woman to make a decision in seconds. If the man is on one knee with a sparkling diamond, a woman will be under enormous strain to say yes. If an engagement is expected and the proposal is more of a formality, it’s OK to have a ring. On the other hand, if it has been a short relationship, or the proposal is a total surprise, the woman might need a little time to get used to the idea and contemplate her answer. The second reason why a man shouldn’t propose with a ring is that his girlfriend may not like the style and design he has picked. There are countless options when it comes to engagement rings, and women often have a specific look in mind. Some women prefer to pick the ring themselves; after all, they will be using it for the rest of their lives. The colour of the metal is a crucial factor, as well as the look of setting, the kind of stone you want, and whether the ring is contemporary or traditional. The most important reason why a guy should already hold the engagement ring when he proposes is that it is a real sign that he has considered carefully what he is asking and has prepared the proposal. If a man has seen the trouble and cost of selecting as well as buying an engagement ring, his bride-to-be can be assured that his proposal didn’t arise from a spontaneous feeling that he might come to regret, but that he has really decided he wishes to spend the rest of his life with her. The more obvious reason why a man should purchase the ring before he proposes is the romance factor. The ring is a real symbol of the engagement, and being able to have it on straight away shows that the engagement begins right that very moment. All the Hollywood movies feature the leading man pulling out a delicate jewellery box from his coat pocket and slipping the sparkling diamond onto the leading lady’s finger. Given the opposing views on whether or not a man should propose with an engagement ring, a number of people are trying to find a compromise. 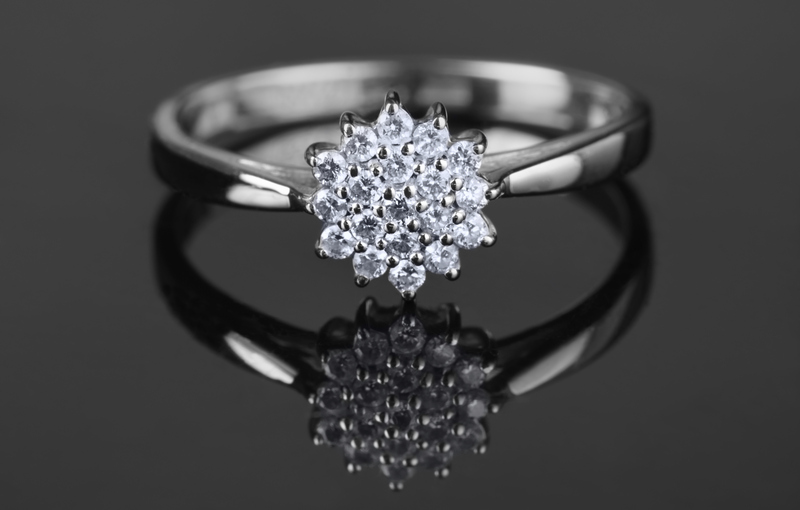 It is now fairly common for a man to purchase a relatively inexpensive ring for the proposal, and then for the couple to shop for the real engagement ring at a later date. This is a great arrangement as the temporary ring still provides the romantic edge, and shows that the man has considered the engagement, but the bride only wears the ring for a short period and can select her own look later. As the man hasn’t put too much money in the temporary ring, it shouldn’t influence the woman’s answer.